Which states have the most Amish? Here are the top ten Amish states, according to 2014 figures from the Young Center for Anabaptist and Pietist Studies at Elizabethtown College. 1. 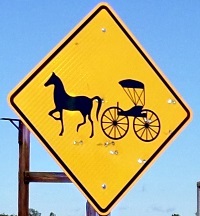 Ohio – Two of the four largest Amish settlements (Holmes County and Geauga County) are in the Buckeye State. Ohio also has the most individual settlements, with 55. 2. Pennsylvania – Pennsylvania’s Amish population is estimated to be nearly identical to Ohio’s (67,230 vs. 67,045). The only surviving settlements dating to the 1700s–three in total–are in the Keystone State. 3. Indiana – The next state on this list, Wisconsin, has over twice as many settlements as Indiana (21 vs. 47). But Indiana has a lot of large communities–five of them have over 3,000 people (with the largest over 20,000). Indiana is also home to the largest Swiss Amish population. 4. Wisconsin – After the big three of Ohio, Pennsylvania, and Indiana, the numbers drop off quite a bit–from over 50,000 Amish in Indiana to around 17,000 in Wisconsin. One-third of Wisconsin’s roughly 4 dozen communities have been founded since 2000. 5. New York – New York’s oldest Amish settlement is not really that old – 1949 – but Amish have really liked moving there in recent years. Around 2/3 of its 50 communities did not exist prior to 2000. 6. Michigan – Over 13,000 Amish in 40 settlements, from southern Michigan all the way to the Upper Peninsula. Centreville (St. Joseph County) is the Wolverine State’s largest and oldest Amish location. 7. Missouri – The Show Me State has shown itself a good place for Amish to settle, with over half its 40-some communities created this millenium. The last state on our list with at least 10,000 Amish (Missouri has around 11,000). 8. Kentucky – Home to one of the fastest-growing Amish settlements, at Munfordville. Around three-dozen Amish locations, few of which are in the Appalachian region of the state. 9. Iowa – Kalona is the Hawkeye State’s largest and oldest settlement (around 1,500 Amish; founded 1846). Amish have clustered in two areas: the southeast/near the Missouri border, and in the northeast. 10. Illinois – Over half of this state’s approximately 7,000 Amish live in one community – Arthur. Bonus: Number 11 is not a state – it’s Ontario, with an estimated 4,860 Amish. Ontario is followed by Minnesota, Tennessee, Kansas, and Delaware to round out the top 15. For more on where the Amish live, view our 2014 Amish population infographic. Additional source: JAPAS Amish community listings. Sorry but I see no contact info anywhere so I decided to try and contact you here. I am likely going to purchase a small Amish farm in Seymour MO. It is only 4 acres as the previous owner was a harness maker. I would like to leave it original as possible and perhaps even get Amish furniture for it. The flip side is that I would never be able to sell it as most English want a modern looking home with electric and plumbing and a 4 acre farm does not attract many Amish. It has sat empty for years. Any thoughts from the readers? I’m not sure how extensive tourism is in that area, you would know better, but a bed and breakfast could be a nice idea. You see them in larger settlements. I have a really good furniture maker in Seymour that I can direct you to, if you don’t already have one. If you are interested, reply and I will look up his contact info for you. That comment title should have said “Furniture” maker, not “rurniture” maker! Yea Doc I haven’t any furniture makers contacted yet. FWIW I have met the wood stove dealer, and the Aeromotor windmill dealer. There is also a chimtek dealer I am told…. The Amish become dealers for a lot of things and then sell to each other and usually us very inexpensively. He makes cabinets, trunks, shelf’s, bookcases and much more. Has a nice photo album of past projects & will, for the right money, go on the road to install built-ins. If you happen to go by his shop, be sure to get him to show you the treadmill for the horses that are used to power all of the equipment in the shop. Ingenious application of mechanical advantage / gear reduction. We were there in early August & I took some photos of the setup. If I can remember to, I will send them to Erik to post. Illinois is a couple thousand-plus ahead of the next on the list and about a thousand behind Iowa so no need to worry, I expect they’ll stay where they are for awhile. I would hazard a guess that even a few people in that other college town south of you;)feel the same way. In case you are wondering, Yes, I am from the state down south. I think there still are more Mennonites in the province than there are Amish. I don’t live in the country, but occasionally, as I’ve must have said, I see the odd Old Order person where I live. Like the plain people I saw go into the Tim Horton’s near my place this summer. Mellisa – well I am from and in Florida – I just figured calling Michigan the Wolverine state would ld be akin to callin Florida the Gator state…. Oh the shame if he did…. At least Florida has gators. From what I hear, Michigan, (oops, I mean “The state up north”) doesn’t have any more wolverines. As bad as they have been doing, maybe they could change their name to the Weasels, or another small rodent. Ha, Ha!